I want to thank you for reading my P90X Review. I’m posting my review for two reasons. Most importantly, I want to be able to encourage people to lose weight, get in great shape, and live a happier, healthier life. I’m a normal person just like you. I have a family, a job, responsibilities. All of us have little time, and every minute of the day is generally spoken for. But being a normal person, like you, I still found the time, and made a promise to myself, to get in shape and lose weight. You just have to get started! Take it one day at a time. The second reason, is a selfish one. After several years of hard work and dedication, it’s always nice to get some recognition for your hard work. And for those two reasons, I would like to extend an invitation to you. If you are ready to get in shape, and lose weight, I’m here to help you. Just let me know. As a Team Beachbody coach, I can answer questions, support you, motivate you. Then once you get in great shape, or if you have already gotten in great shape, I would like to personally invite you to send me your P90X Reviews. I will gladly post those reviews for the same two reasons I posted mine. To motivate and support others, and to give you the recognition for your hard work. Please do not hesitate to contact me for help, or with a P90X Review! Email me HERE. I will email you back as quickly as possible. August of 2005 was a life changing moment. I was watching an infomercial from Beachbody on Power 90. I was tipping the scale at 205 lbs, the heaviest I have ever been. I was eating anything and everything, and was not doing any exercise. And I came upon the realization that I was just not losing weight as I had when I was younger. So the infomercial really interested me. Here were all these people that had lost weight in 90 days. The infomercial stated a guarantee, and I was sold. I told myself that I would work hard for 90 days and see what happened. Worse case scenario, I’ll send it back for a refund. Little did I know that over the course of the next 90 days, I would lose 30+ lbs! That was all it took, I was hooked! So naturally, finding that fitness was starting to be fun, and habit forming, I decided to take it to the next level. I ordered P90X! During this time, my friends told me that I didn’t have the “genetics” for six pack abs. So I decided to prove some people wrong and give 110% to P90X. When the program came in, I was surprised at how thorough the program was. I had 12 DVD’s, a fitness guide and a nutritional guide. Everything was laid out for me in three phases. Each day, I simply followed the guides. Everything was detailed for me. I knew how many calories I was supposed to eat, I knew what foods I was supposed to eat, and I knew what exercise DVD to do each day. It made the entire program SIMPLE. But what wasn’t SIMPLE was the workouts! Tony Horton, the trainer, will say in one of his workout programs, “Get your mind right!”. And that’s exactly what you have to do. You work your mind as much as you work your body. You have to work hard, you have to dig down deep, and get determined. It’s not an easy program. Being overweight, tired all the time, out of shape, and unhealthy is EASY, anyone can do that. But to get in great shape, the best shape of your life, the kind of shape I am in right now, you have to get your mind right. But it’s without a doubt one of the most rewarding things you will ever do in your life! For 90 days, I worked hard, I ate right, I watched and learned from others, and when it was over, I felt great. I enjoy being able to do things, I couldn’t do when I was younger! When I started this program, I was able to do 3 (yes only 3) chin ups. Today, I can do 21 chin ups! There are no limitations, you can do whatever you want to do! Age doesn’t matter, you can break through all the barriers and achieve greatness. You may think the cost is a factor. It’s not! I’ve completed 8 rounds. I’m getting my money’s worth! One round of P90X is 90 days. The workouts will be challenging, they keep changing, it stays exciting, and you don’t get that same old routine feeling. This is a COMPLETE program. The absolute best part, is that you earn back every bit of your money spent. No more gym memberships, you work out at home. The program comes with three routines, so you can change it up, and keep going for a 2nd and 3rd round. I’m on round 8, and I’m not slowing down yet! You may think time is a factor. It’s not! Everyone has just one hour a day to devote to their health and happiness. I absolutely love this program, being in my mid 30’s, and being in better shape now than when I was 18 and in the Army is just incredible! I have included my progress picture top left. This program works! And I have the six pack abs my friends told I could never have. You work cardio, you lift weights or bands, and you will want a place to do pull-ups. You can use something homemade or use the P90X Chin Up Bar. Buy P90X, you won’t regret it. I tell everyone, make sure you take day 1 pictures. And take pictures again every 30 days. You will compare these pictures and be so surprised at your results. I can not encourage you enough, make an investment in your health and your life. Trust me, after 8 rounds, I still love this program. I’m married, have two young children, a busy lifestyle. But through this, I have P90X. One hour or so a day. Make time for one hour, be selfish with your fitness, live a longer, happier life. Do things you did when you were younger! I know weigh 165 lbs, and have 8% bodyfat, and I’m a normal person like anyone else. Anyone can do it! Determination, clean diet, one day at a time. I started out just like you, I wanted to get in shape. Just a few pounds at a time, one day at a time. Feel free to contact me. I will help you, I will coach you, together we can get in shape, stay in shape. We can be Extremely-Fit! Thank you again for reading my P90X Review. Check out all of my P90X Fitness Articles. 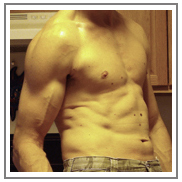 Here are a few of our customers getting GREAT results with P90X! (Longer more thorough reviews will be posted separately). Have you started P90X recently? Or just completed the program and have a P90X Review you would like to share? Please send your testimonials by clicking here! Hey- for all of you readers – I’ve known him since he was 9 and he’s right about being in the best shape of his life. 5 years ago we both lived in NM and he has dropped an amazing amount of weight. If it worked for him, it can work for anyone. Thanks for the encouragement. Just a technical question. I’ve seen people state their body fat percentage on their reviews, as well as yours. How do you find that out? Does the Power90X help you to find that or do I have to get it measured at a members-only gym? There are many ways to check your body fat. An easy and inexpensive way is to use body fat calipers. A local gym can test it as well. Good luck, and contact us anytime. You can also use our contact form with additional questions! I started the P90X program 3 weeks ago and I just have a little trouble with the session of Yoga, I mean with the movement, postures. Is the only workout when I ended the session I’m completely frustrated. Yoga is something that takes time. If you stick with it, you should slowly see an increase in flexibility and coordination. I have always done the first 45 minutes of Yoga X, and skipped the balance postures. But now I use the One on One: Fountain of Youth Yoga program by Tony Horton, it’s 45 minutes total, and I like it much more than the Yoga X, but that’s only my personal preference. You can take a look at it here if you like. One on One with Tony Horton. I am going to be in the middle of my p90x during thanksgiving. can i take a day off of the diet? or should i start the program after the holiday?